Saturday January 12th 1878 It was late this morning when we got up. It took till noon to get through with the morning work. Aunt Lib was here for dinner. She invited us all down there to a party next Friday night. Mother went to town in the afternoon and got a study table for Robs room, a bed for Lee's and three new chairs. I baked cake while she was gone and Hatt ironed. I made the ticks for Lee's bed after she came home. I knit all the evening. 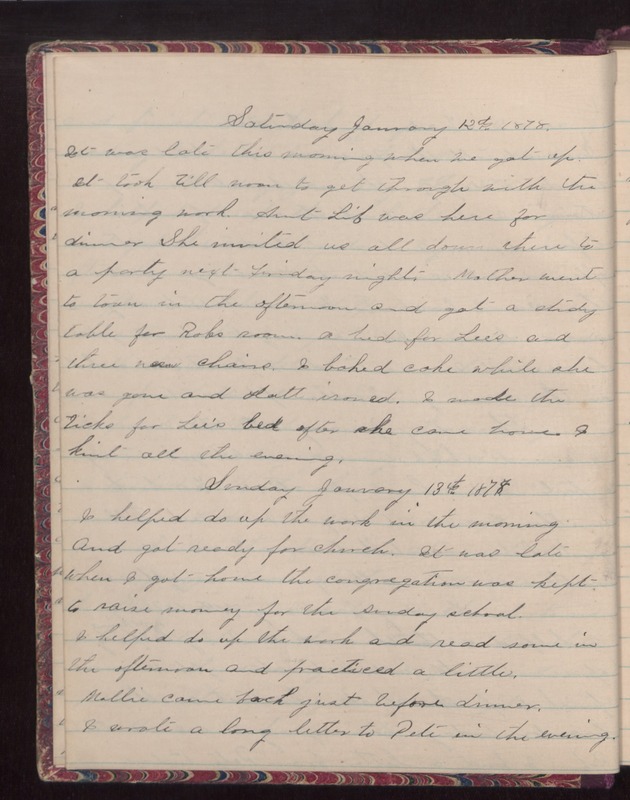 Sunday January 13th 1878 I helped do up the work in the morning and got ready for church. It was late when I got home the congregation was kept to raise money for the Sunday school. I helped do up the work and practiced a little. Mollie came back just before dinner. I wrote a long letter to Pete in the evening.